Hands down Autumn is my favorite season. It's what I miss the most living in Texas. In Missouri the leaves changed, everything became crisp and crunch, I loved it. During my long hot years in Texas I have learned to mark the changing of summer to fall with new things. First there is the non-stop sneezing and watery eyes that my entire family gets. Secondly there is Starbucks Pumpkin Spice Latte--the best tastes of fall in a cup. So when I start sneezing and see Pumpkin Spice on the menu I pull out all my fall smelling candles and hit the craft room to bring a little fall into my day. I have two things to share today. 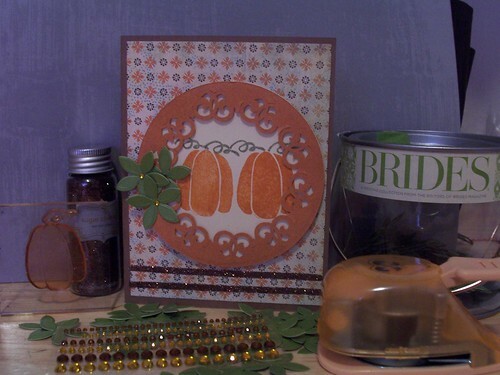 The first is a fall card I created to send to an Alzheimer care giver for the blog candy here. It is such an awsome prize and what a great way to give! If you get a chance, please send a card. 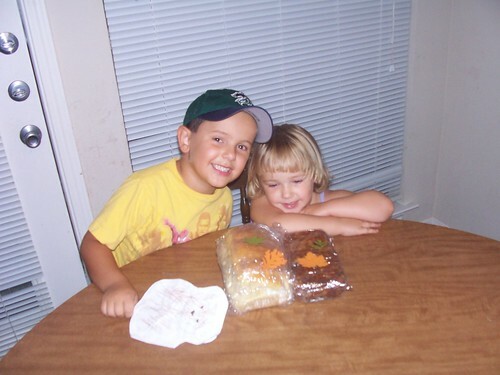 The second picture is my two darlings with some bread we baked recently to share with friends.